Texas Freckles: Snow and the Superbowl descend on Texas. 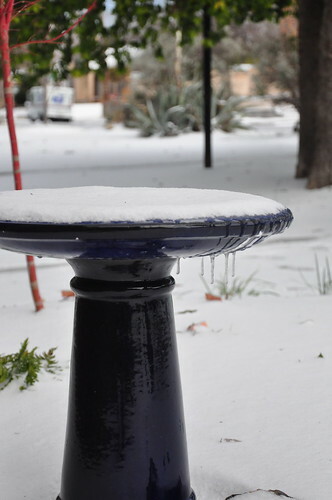 Snow and the Superbowl descend on Texas. Just in time for the crowds arriving for the big game, ice and snow descended on north Texas last night. We had a record snowfall last February, and this year we may hit some record lows. It's hard to believe that on Saturday (four days ago), it was 76° and sunny! I worked outside all day in shorts and a t-shirt. Welcome to Texas. 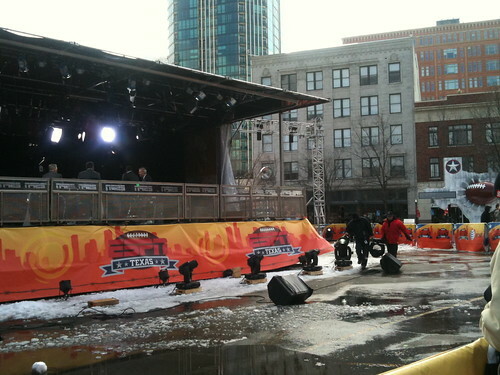 Earlier today, we made a quick stop in downtown to see the ESPN set-up for the Superbowl. I think the Packers and Steelers fans felt right at home in the cold weather. Did you see us waving from the crowd on ESPN? On the local news last night, I heard that the city had purchased a new ATV "snowplow" just in case something happened during Superbowl week. 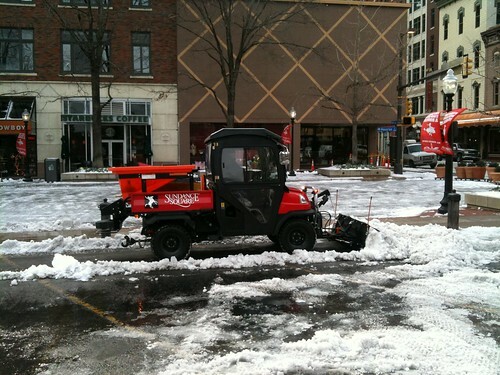 I'm sure they are excited that they got to put it to use, but all I can think about is how stupid the only snowplow in downtown must look to our visitors. Everything's bigger in Texas... except the snowplows. 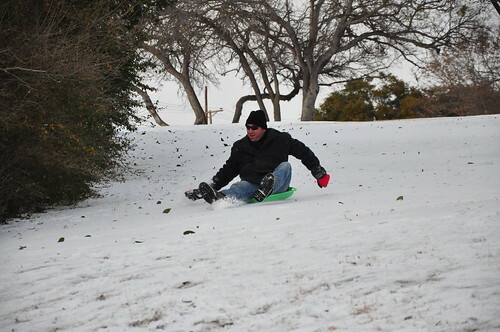 There's a park by our house with a great hill for sledding. We have some sleds we bought in Colorado and we love getting to use them one or two days out of the year. 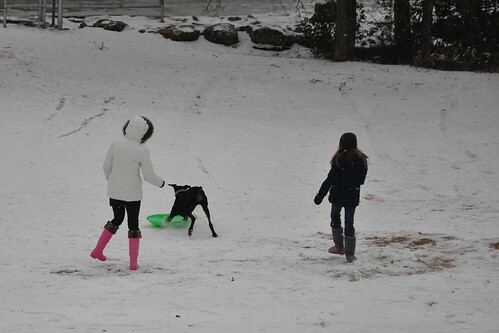 (You can't buy a sled in these parts.) 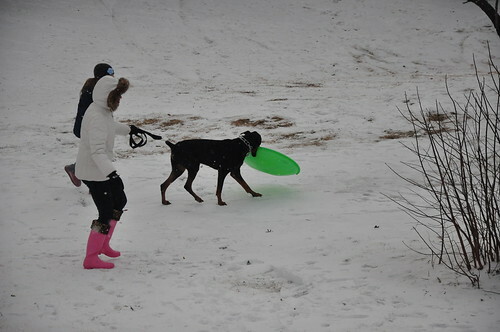 The other sledders today were sledding Texas-style on wake boards, garbage can lids, cardboard boxes, and inflatable pool floats. The cardboard boxes seemed to be the fastest of the four. until he ended up with both front paws on it and took off sliding down the hill. I think we thought it was much funnier than he did because he wouldn't go near it after that. School was out today and we just got word that it's canceled again tomorrow. If this storm came your way, stay safe and warm! It's cold out there! Snow days are the BEST! We get lots of them in NY where I live so I'm glad you get to have one too. They are perfect for sewing and baking and watching movies. Enjoy!! don't you love tx??? in my parts (close to galveston), they started rolling blackouts at 6am. just in time for getting ready for school and work. no power for your shower is not fun. if we had snow, at least we could have fun. instead, it's just a damp cold. So easy it's like cheating. Oh, wait, it is. Jumping in and a little giveaway.